Sulphur-Covered Zinc Box (Plugged Corner) | Ich bin ein Sender. Ich strahle aus! | I am a sender. I transmit! Each box 64 x 31 x 18 cm. 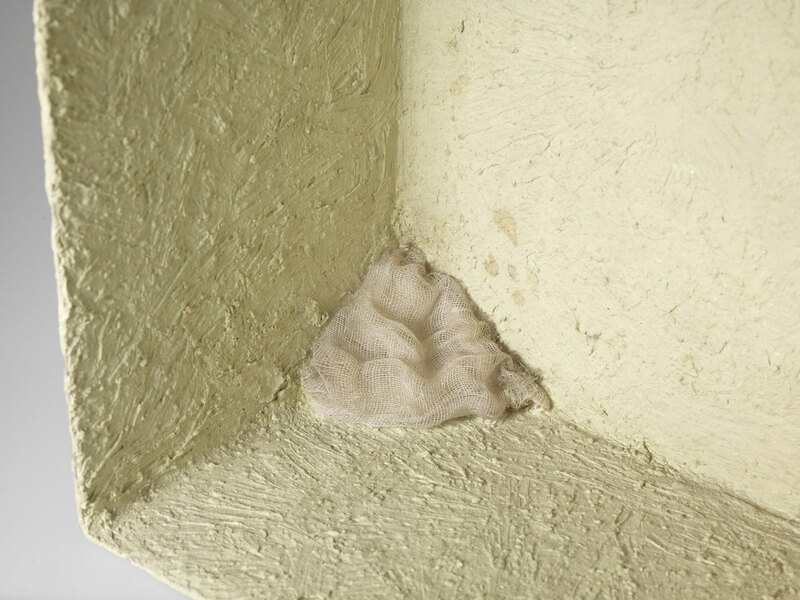 This multiple consists of two open boxes made of zinc.1 The first box is coated in a layer of yellow sulphur and contains a small triangle of gauze, pressed into one of its corners. 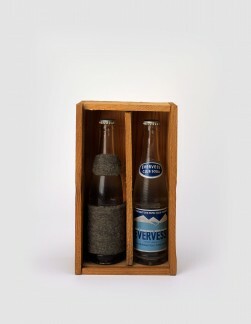 Beuys often used open boxes as metaphoric stand-ins for the human head, whose inner workings he modelled through his symbolic deployment of materials.2 Here, the presence of sulphur, zinc and gauze suggests that these metal ‘heads’ are in tune with both rational and spiritual modes of experience. 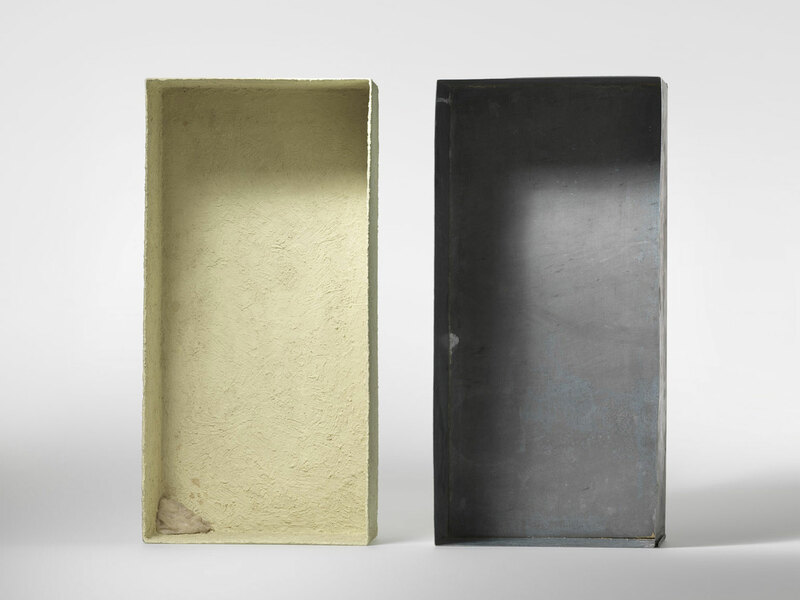 The rational capacities of the boxes are symbolised by their rigid geometries, which Beuys aligned with the workings of reason, a mode of experience that he saw as confined to the material realm.3 Their spiritual attunement, by contrast, is signalled by their component materials. Zinc, for example, is a metal that is often present in the terminals of batteries, to which Beuys made frequent reference in his art. A highly conductive metal, zinc typically functions as an ‘anode,’ which enables the flow of current between a battery and a connected device. Here, it can be seen to relay energy from the outside world into the inner reaches of the mind. 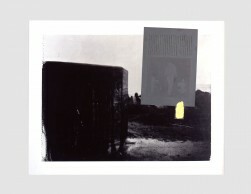 That the word ‘anode’ originally meant ‘Eastern electrode’ suggests that this energy is likely to be spiritual in nature, for Beuys regarded Eastern societies as more spiritually attuned than those of the materialistic West.4 Sulphur, a highly flammable material, also functioned as a spiritual energy transmitter in Beuys’s work. This function is further reinforced by the small wad of gauze that lies within it. Acting as a filter, the gauze sifts the spiritual energies from the material signals that reach it from the box’s exterior.5 A soft and pliant substance, Beuys placed it in one corner of the box as a means of counterbalancing the box’s geometries: ‘The corner,’ as Beuys once explained, ‘symbolises the most mechanistic tendency of the human mind, the cornerstone of our present society, as manifested in our square rooms, square buildings and square cities…. 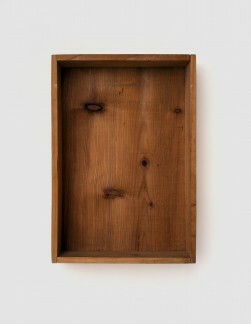 Extending in meaning, it represents the mineralised co-ordinate system of our culture, science and living processes.’6 By aligning his zinc boxes with both reason and intuition, Beuys deployed them as allegories of an ideal human subject, capable of transcending the limits of materialistic thought to embrace more spiritual modes of experience.